This beautiful Gazebo-shaped Palekh lacquer box was designed and hand-made by famous Russian artist Kukharkin, it features a scene from the gorgeous Alexander Pushkin's Fairytale "The Tale of Tsar Saltan", being appreciated throughout the world. 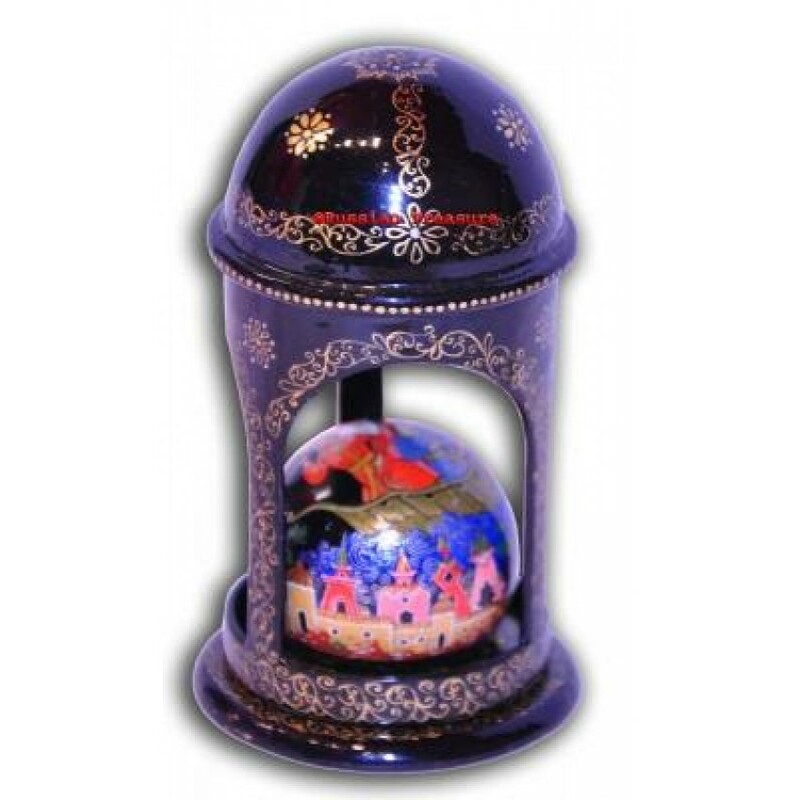 The lacquer box is not of traditional Palekh form, it consists of three elements: a stable base, globe-shaped lid of the lacquer box, and affected Gazebo-shaped part. The magnificent illustration of the tale is put onto the spherical lid of the lacquer box, being skilfully painted all-round. In the center of the composition, more precisely on the top of the lacquer box lid, we can see Tsar Saltan sailing in the wooden boat towards Prince Gvidon’s Tsardom. On the sides the lacquer box lid is elegantly framed with the isle itself - Prince Gvidon’s Tsardom. Carefully drawn colourful luxurious chambers, towers and trees are accented with delicate touch of gold. No wonder, that these four characters gaze at it, because it is really magnificent. Placement and design are keys to the success of this lacquer box. A thinness of painting and an intricately detailed population work achieve the goal of the artist – to charm the viewer. Egg-tempera paint is the primary medium used to compose this lacquer box. The Palekh lacquer box is constructed from high-quality paper-mache. Black lacquer, the traditional background of Palekh pieces, is used to paint the exterior of the lacquer box. The pattern of golden scrollwork used to paint the framing for the composition is exquisite. It appears like the rolling current of the ocean, gliding all the way around the artistry. The flowers that ornament the miniature have been accentuated with bright aluminum petals. The base of the box has been decorated with a romantic filigree combination. This phenomenal lacquer box will become an outstanding exhibit in you Russian fine art collection. Mind, that all the items in Russian Treasure shop are in one copy only, they are unique and exclusive ones.